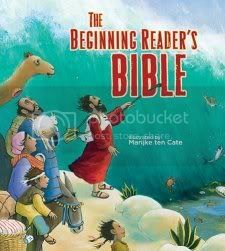 I received this book for review also and thought I would be getting an easy read children's Bible. I love it! It's so beautiful and the illustrations are wonderful for any age. My 7 year old read half of the book in two days! I guess I should go write my review now, lol. This sounds wonderful. I will have to look for it for JDaniel.